Software in the Design community can be intimidating and Revit is no exception. When software is “Powerful”, you can expect screen full of toolbars, buttons and multiple ways to navigate the same command. In addition, with 3D modeling and working in orthographic projected views, you have 3D information literally on top one another. So if you have worked in Revit, collaboratively with Worksets/multiple users, etc., you may have experienced this situations. 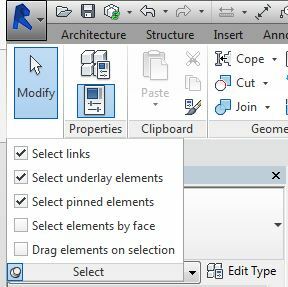 Here is a tip to remedy accidental movement while working in Revit. Now in Revit 2014 and up, pinning has become better. In the past, you could still move elements that were pinned. Another way to prevent movement of elements is by not categories you don’t want to be selected. Read below. Uncheck the categories you don’t want move by selection and this will protect them from accidental movement.